This Saturday, August 18, NBC Bay Area and Telemundo 48 are teaming up again for our fourth annual Clear the Shelters! This nationwide pet adoption drive, led by NBC and Telemundo stations, helps animals find their forever home and raise awareness about the importance of pet adoption. 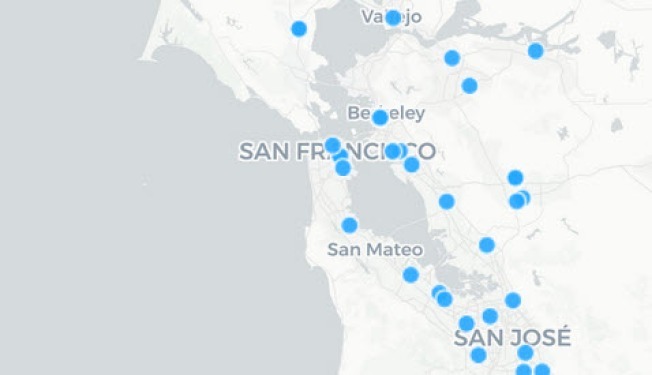 More than 50 locations are participating throughout the greater Bay Area. Tens of thousands of pets were adopted during last year’s event, but millions more remain homeless. Every year, 7.6 million animals end up in shelters nationwide — and only 2.7 million are adopted, according to the ASPCA. Dozens of local shelters will take part this year in Clear the Shelters. Most participating shelters are waiving or reducing adoption fees. Refer to the interactive map above for further details and to find a participating shelter near you. Stop by the NBC Bay Area booth for pet tag engraving, games and prizes! Say hello to Today in the Bay anchors Marcus Washington and Laura Garcia until 12 noon. Stop by and meet NBC Bay Area Consumer Investigator Chris Chmura, who will be at the care center from 10 a.m. to 2 p.m.
Meet NBC Bay Area's Melissa Colorado, who will be at the shelter from 11 a.m. to 12 noon. Say hello to NBC Bay Area anchor Jessica Aguirre and Chief Meteorologist Jeff Ranieri, who will be at the rescue foundation from 12 to 6 p.m.
Meet NBC Bay Area reporter Sam Brock, who will be at the SPCA from 11 a.m. to 6 p.m.